Authentic handcrafted carriage house designs combine historical charm and character with the convenience of automatic overhead operation. 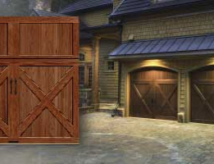 A natural wood carriage house door is the kind of door that gets people talking. A vast selection of designs and wood species combined with multiple window options. Factory Painted or stained, to complement any architectural style and color scheme.